After a successful North American run as the support act for MEGADETH, SUICIDAL TENDENCIES has announced a return to Europe for some festival appearances as well as select headlining shows. 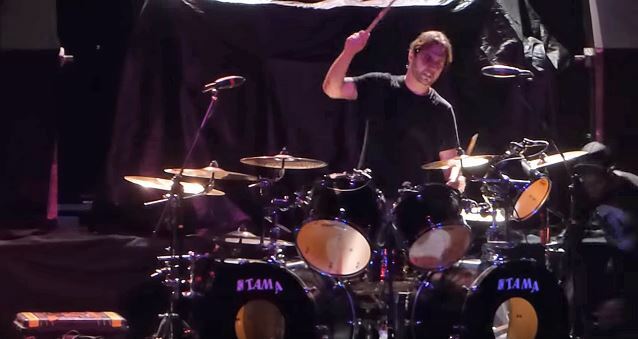 Sitting behind the drum kit for SUICIDAL TENDENCIES once again will be former SLAYER drummer Dave Lombardo. SUICIDAL TENDENCIES frontman Mike Muir told The Bulletin about Lombardo's addition to the band: "Dave's a legend, you know. It's a little bit different than other things — people call him the godfather of the double-kick and bass and stuff. He just has an amazing intensity, but besides intensity, he just has a musical mindset that — he totally understands what we're doing and where we came from when we started, different, but at the same time and stuff. We've always kind of done shows together, this and that, been kind of close. He knows where he's coming from is the right place." Lombardo made his live debut with SUICIDAL TENDENCIES on February 26 at Pearl Concert Theater at Palms Casino Resort in Las Vegas, Nevada. Muir recently hinted at not one, but two follow-ups to the group's 2013 album "13" — an EP and a full-length — inspired by the current political climate and upcoming election. He did not reveal any information about these new releases, but implied that these may be the band's final recordings. However, he pointed out: "I thought the first one would probably be the last we would do, too." "13" sold around 3,200 copies in the United States in its first week of release to debut at position No. 187 on The Billboard 200 chart. The first studio album in 13 years from SUICIDAL TENDENCIES was produced by vocalist Mike Muir and Grammy-nominated engineer/mixer Paul Northfield (DREAM THEATER, HOLE, RUSH).